Monday: A very uninspired T25 workout. I just wasn't feeling it. I think I was suffering some burnout from four or five weeks of really strong training. Tuesday: I had an after school meeting and then we had an art showcase until 7pm, so I only had time to squeeze in some yoga between 4:30 and 5pm, when parents began arriving. The yoga was...again, not great, but my legs felt good afterward and at least I put on workout clothes! Wednesday: Best workout of the week! I think finally my burnout gave way. Because of scheduling, I had to run alone (although Matt joined me last minute) so I ended up getting a late start. 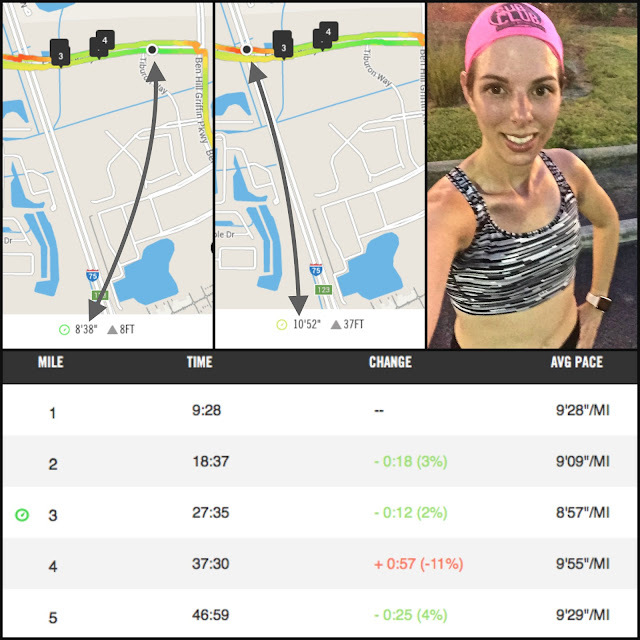 I wanted to run the bridge four times; I did what felt like an easy warmup (2/3 mile) and was surprised to see a 9:19 pace! The bridge felt great; I saw some 8s on the ascents and descents on the first two repeats; then I wanted to quit. But I finished it off and did the entire workout. Around mile 3.7, I let myself walk a tiny bit when I got to the top of the bridge for the last time. Even with that walk break, I kept my overall pace well under 10. Because I crossed the street at the end of the bridge to run the opposite side, I was able to get the benefits of the different slopes. I also only climbed on two of the four slopes, and descended on the other two; in other words, I can look at my elevation map and my paces and know if I was ascending or descending, and it's kind of awesome to see 8s on the ascents! This run gave me a huge confidence boost. Not only did I feel strong, but I didn't let myself quit when I wanted to. I ended up doing 5 miles and finished the last tenth at an 8:49 sprint. I thought, "I need to run Saturday's entire race at this pace" and felt a bit defeated because it felt so hard, but Matt pointed out that the sprint was at the tail end of a 5 mile bridge run, so I really shouldn't feel bad about how hard it felt. Now I'm hopeful that I'm ready for that 10k PR I'll be aiming for at Sanibel in October. Thursday: More meetings. This time of year is insane. Rest day! Friday: Other than some planks and foam-rolling, another rest day. I hydrated like a crazy person in preparation for Saturday's 5k...to the point that I had to lock my students out of my classroom briefly so I could use my bathroom in peace haha! 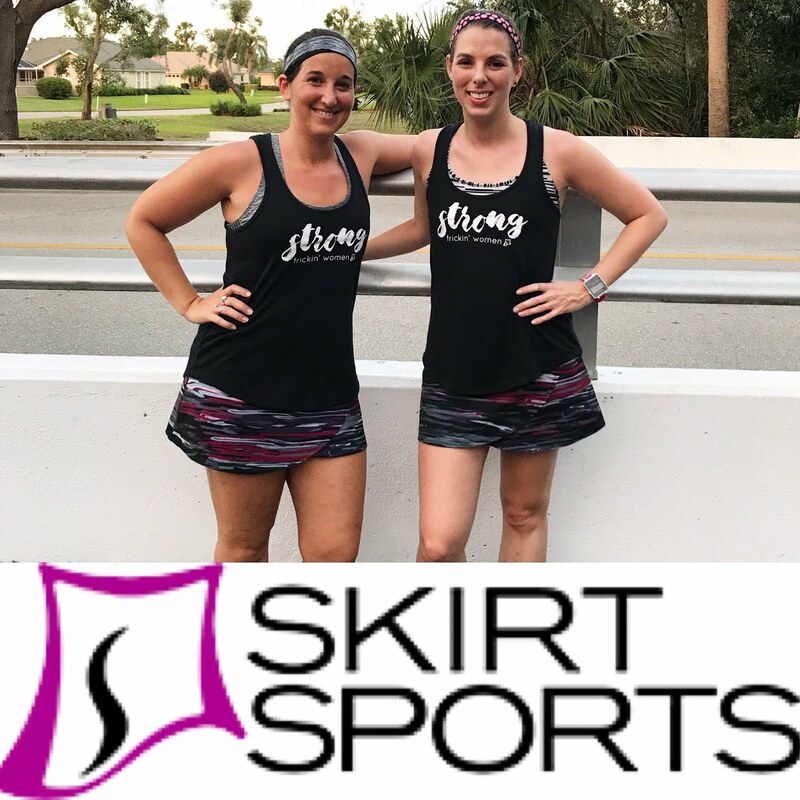 Saturday: The Sup & Run 5k! I'll post more about this Tuesday but let's just say...it went very well! Stay tuned for a full report Tuesday! Sunday: We drove to Orlando for Shane and Mark's baby shower/a college reunion of sorts, and I wasn't sure if I'd want to run or rest Sunday morning. I packed running clothes in case and played it by ear. After a long day and late night with friends, I decided to rest Sunday. What was your highlight workout for the week? WOW really nice bridge run! I think it's a little bit weird that Hansons doesn't include any bridge runs for speedwork. It seems like you enjoy doing bridge repeats, and I actually "like" them too. I mean, they're tough, but it's the only time we get any real elevation change in a run isn't it? Hah! I think it's weird they don't put any hill stuff in, but I guess they figure we know whether the course is going to be hilly or not and should do our long runs or easy runs on hills? Who knows. Great week, Ali! I can't wait to hear more about your 5k! What is your 10k PR right now and what are you aiming for? Awesome bridge run! I saw your hint about your 5k on IG & can't wait for your recap. So excited for you! That is very exciting!! 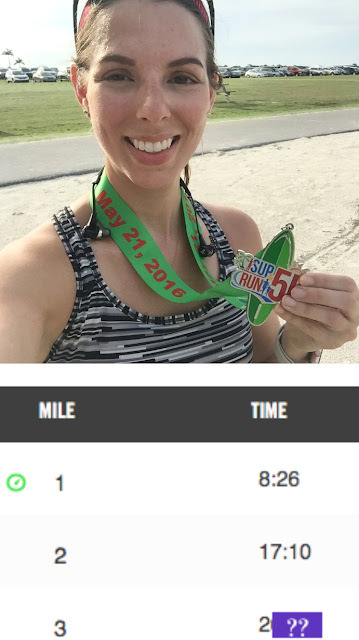 I am pretty confident that you met your 5K Goal!! Cant' wait to hear more tomorrow! Congratulations on the shiny new PR!!!!! I'm interested in hearing more about your 5K! I haven't done a "timed" 5K in a while and am hoping to work towards a few this summer!